On the walls and in the cases of art museums is a priceless source of inspiration to America’s fabric designers. Twenty and more centuries of art…covering the span of civilization…yes, even the cave dweller’s crude forms scrtached on prehistoric walls of granite…offer a wealth of ideas. Every field of fashion…not fabric alone, but apparel…and accessories…and home furnishings…can tap this Midas mint. Perhaps it is an urn of Grecian mould which suggests a graceful print…an Etruscan coin which hints at a brocade design…a vivid Van Gogh which yirlds up a broad range of tones for sportswear fabrics. Or, it may be, a South Seas tapa which can be adapted to cool summer drapes… Picasso’s famed Blue which insinuates a new sophistication in evening fabrics…ancient Peruvian cloths dictating new concepts of weave for a man’s sports jacket. The American fabric designer has all of this…aye, and much more…as inspiration and help. All that is needed is an open mind… a keen perceptive eye…a daring imagination. This was only the beginning of the magazine’s crusade to use art as inspiration to fabric designers. Almost all the issues of their first fifteen years contain some reference to art. Since this was a trade magazine for fabric makers, clothing designers and apparel makers, it was bound to have some influence. Maybe that is why we have so many wonderful fabrics from the late 1940s and the 1950s that were directly based on works of art. 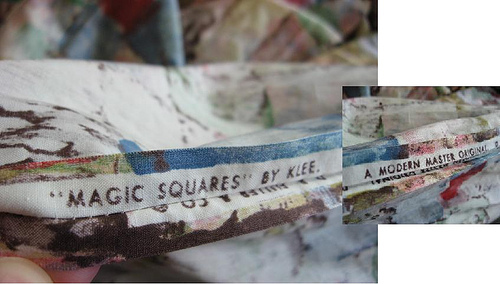 The skirt pictured was made from a fabric based on Paul Klee’s Magic Squares. 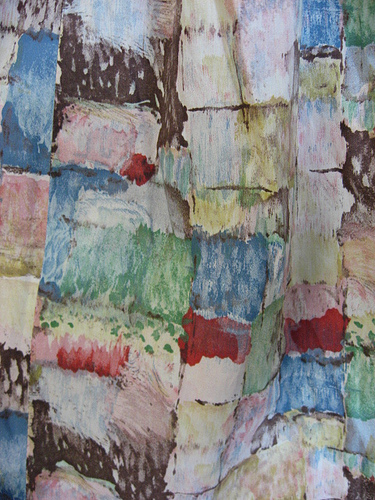 Fuller Fabrics released an entire line of art fabrics which they called the Modern Masters. They were lucky enough to have Life magazine do a feature on clothing made from the fabrics in a 1955 article. I’d love to say that this skirt is mine, but I’m afraid it belongs to another vintage clothing fan, Karen at Small Earth Vintage. 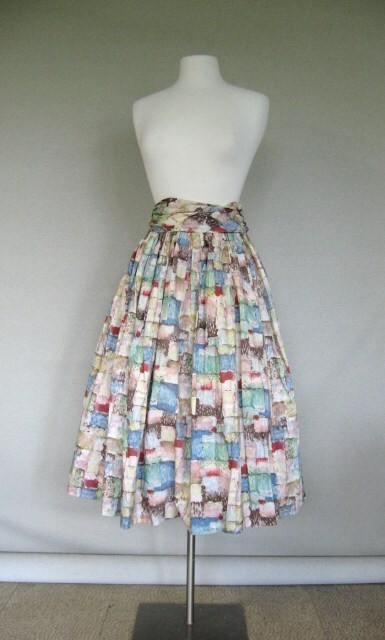 Go to her blog to read about how she found the skirt, and how she researched the fabric. She also has a link to that great Life article. And the next time you find an interesting looking fabric that looks like an artist designed it, check out the selvedge. There were several different companies that offered art prints, including a line that was sold at JC Penney. By chance, I read that an artist friend of my deceased husband listed design work for Fuller Fabrics. Thomas Dorsey of NY and NJ had museum quality work for many sites , using Mohegan influences in many mediums.